Comment on Sarashi's Muramasa Rebirth Box Art / Cover. oh woah you are seriously on a roll! really nice work, I really like this! It looks really elegant whilst still looking action pack and well composed! Keep it up Sarashi! Yeah, it's simple... and it works! 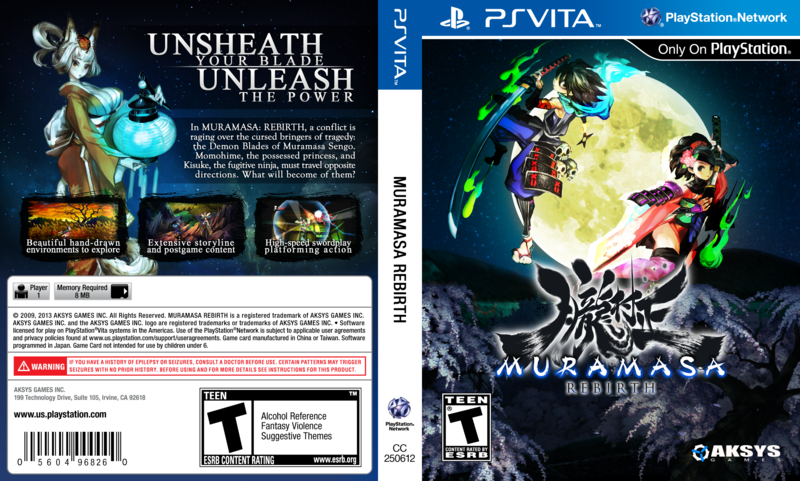 Now, there are Muramasa boxes (I made one) but none about the PS Vita port/enhanced version, until now. I like the front a lot. @Sarashi Thank You so much!!!!!!!!!!!!!!!!!! Please check other comments. There is already link for the printable. Exec: 0.22009993 © 2004-2016 VGBoxArt.com. All rights reserved. Crafted in San Francisco by Reed.